When I was about 7 years old, my family won a trip to Walt Disney World from a local radio station. The vacation was amazing! We stayed at Wilderness Lodge, dined at many of the wonderful table service restaurants, and of course experienced many of the great Disney attractions. The above photo of my mom, grandmother, and me is one of many great photos from our free Disney World vacation. It was a wonderful experience I will never forget. 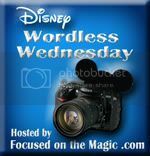 Thanks to Deb at Focused On The Magic for hosting the Wordless Wednesday blog hop! Hop on over to her site to check out some other great Disney photos! What an amazing prize and wonderful memories! I love Wilderness Lodge and that’s a great photo of it! Thanks! It’s such a beautiful resort! Wow, that’s awesome! What a great picture, and what a great trip memory! That was the trip that really got my family hooked on Disney! It was so much fun! Wow, what a magical trip you had! I love this picture! You are the cutest and luckiest girl!! What a terrific picture! The Wilderness Lodge is one of my very favorite resorts at WDW. The atmosphere there is unparalleled! Disney does SUCH a great job with their resort themes!!! Wow! What a prize to win! I can only imagine what wonderful memories you must treasure from that trip! Yes, it was probably my favorite trip to Disney (not that the other ones weren’t great too though)! So many great memories!